An ecclesiastical fireplace is most likely to be found in a pastor’s abode, a place that’s also known as a parsonage or vicarage. Very few modern churches of today are built with an actual wood burning fireplace; though a fireplace in any setting adds a welcoming, down-to-earth feeling. The addition of a fireplace to a parsonage or vicarage will add a feeling of tranquility and relaxation and will be a welcome addition. Fireplace mantels and surrounds in glass fiber reinforced concrete (GFRC) can be molded into just about any design to fit your ecclesiastical or church décor. 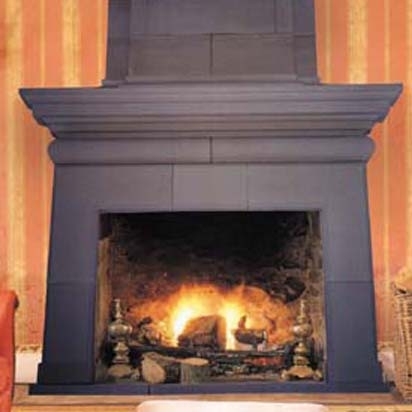 Because GFRC is fire resistant, it’s an outstanding material to use for a fireplace surround or mantle. A Stromberg GFRC mantel or surround won’t rot, crack or swell and can withstand very high levels of heat. When you choose Stromberg for your ecclesiastical fireplace, Stromberg will craft it for you with the look and feel of real limestone or terra cotta; you can also opt for a finish that can be painted so that it works with your décor or color scheme. Glass Fiber Reinforced Concrete uses glass fibers for reinforcement instead of steel; this makes it rust resistant and lightweight. Stromberg led the way in the creation of GFRC 30 years ago; their know-how can be put to work for the creation of your distinctive ecclesiastical fireplace. They have the largest selection of fireplaces you’ll find anywhere, and a wide array of non-combustible materials from which to choose. You can trust Stromberg to craft a high quality, custom fireplace mantle or surround for you. Stromberg’s state-of-the-art shaping process lets you choose from an almost infinite variety of styles. They have pioneered a new technique in which they mold your fireplace mantel or surround into any configuration you choose. GFRC is reinforced with glass fibers instead of steel and therefore won’t rust. GFRC is weather resistant and fire retardant. GFRC can be made to have the look and feel of natural stone. GFRC is an environmentally friendly product. The skilled professionals at Stromberg Architectural Products will work side by side with you until your project is completed to your satisfaction. They’ll help with CAD details, design assistance and specifications. Contact them today at (903) 454-0904 for a free custom quote, or email them.